Abadi’s appointment has the support of a majority of the Shiite bloc that Maliki once led, the State of Law Coalition (SLC, إئتلاف دولة القانون), and Abadi himself is a member of Maliki’s party, Islamic Dawa (حزب الدعوة الإسلامية‎), the leading force in the SLC. Up until his appointment replacing Maliki, Abadi was as a key Maliki ally, for example, siding with Maliki against Ibrahim al-Jaafari, a former prime minister and former Dawa leader who was kicked out the party in 2008 when he moved to establish a competing group. Since April’s elections, Islamic State (الدولة الإسلامية), formerly ISIS or ISIL, suddenly captured Mosul, Tikrit and much of northern Iraq, and Maliki’s position as prime minister became increasingly untenable, among Shiites as well as among Sunnis and Kurds who have increasingly lost trust in Maliki’s competence and trustworthiness. US government officials, including US secretary of state John Kerry, have made it very clear that they will support Abadi’s government against Maliki’s machinations, and the Iranian government and leading Iraqi Shiite cleric Ali al-Sistani have all signaled that they no longer support Maliki. Abadi’s selection reflects the fact that Islamic Dawa and the State of Law Coalition, chiefly under Maliki’s leadership, won the greatest share of seats in the 328-member Council of Representatives (مجلس النواب العراقي‎), Iraq’s unicameral parliament. Two competing Shiite blocs, Muqtada al-Sadr’s Sadrist Movement (التيار الصدري) and Ammar al-Hakim’s Islamic Supreme Council of Iraq (ICSI, المجلس الأعلى الإسلامي العراقي‎), each won around one-third as many seats. 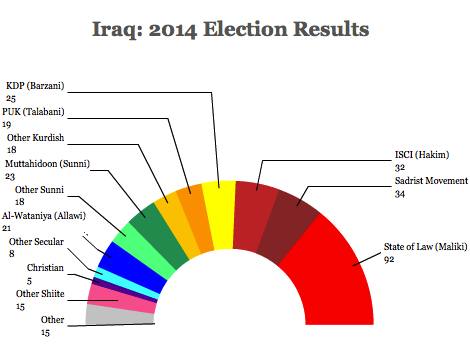 Maliki’s coalition now appears to be crumbling, with SLC legislators divided between Abadi and Maliki. In the meanwhile, Sadr and Hakim are delivering their support to Abadi, giving the new prime minister-designate a clear majority of the wider Shiite bloc in the Council of Representatives. That Massoum, a Kurdish official who himself was only recently elected as Iraq’s new president, formally announced Abadi as prime minister indicates that the Sunni and Kurdish parliamentary blocs are prepared to deliver support to Abadi as well. Nevertheless, it’s worth wondering whether the political game playing out in Baghdad is akin to rearranging the chairs on the deck of the Titanic. As a longtime Dawa member and former Maliki ally, Abadi comes from the same political elite that has so fundamentally mismanaged the country for the past eight years — and increasingly so since Maliki’s reelection in 2010. Though Abadi’s more acceptable to both domestic and international stakeholders in Iraq, there’s not a lot of hope that he represents a rupture from the corruption, division and incompetence that’s tragically marked Iraqi politics over the last decade. Meanwhile, Iraq faces a larger challenge in the Islamic State’s assault on Sunni-dominated Iraq. US president Barack Obama’s decision late Thursday night to approve limited US military airstrikes against Islamic State/ISIS/ISIL reflects not only his desire to prevent atrocities against Iraqi’s minority Yazidi population, but US determination not to let Iraqi Kurdistan fall to Sunni militants, with Islamic State/ISIS/ISIL increasing threatening Erbil over the past few weeks. Though it’s far from perfect, Iraqi Kurdistan, a chiefly autonomous region, and its capital Erbil became a relative oasis of stability during the worst of the post-Saddam sectarian violence in the mid-2000s. To the extent there was a ‘success story’ from the US occupation of Iraq, it’s Iraqi Kurdistan. So it’s understandable that the Obama administration is much more interested in preventing its fall to Sunni radicals. Kurdish fighting forces, or peshmerga, initially held off Islamic State/ISIS/ISIL earlier this summer, even extending Kurdish control to the disputed oil-rich Kirkuk province when Iraqi military fled. But the peshmerga are hardly a united force, instead reflecting two different political parties, the southern-based Patriotic Union of Kurdistan (PUK, یەکێتیی نیشتمانیی کوردستان) of former Iraqi president Jalal Talabani and the northern-based Kurdistan Democratic Party (KDP, پارتی دیموکراتی کوردستان) of Masoud Barzani. Kirkuk, traditionally a heavily Kurdish city before the Saddam-era influx of Sunni Iraqis, could transform Iraqi Kurdistan’s fortunes, giving it enough oil revenues to become economically self-sufficient. But that won’t necessarily happen overnight. It certainly won’t happen if radical Sunni jihadists overrun Erbil, which is why the Obama administration has become so urgently interested in delivering military support to the Kurdish government. 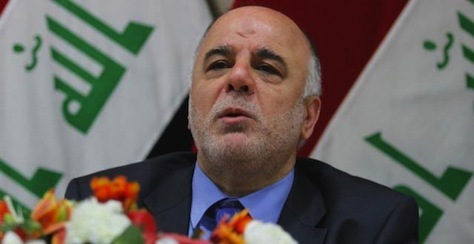 Meanwhile, in Baghdad, Abadi has 30 days to build a government, but his most difficult task may be talking down Maliki from causing a constitutional crisis while the country is in the middle of an existential crisis in fending off Islamic State/ISIS/ISIL. Maliki may yet try to hold power through extraconstitutional means, and the threat of a Maliki coup attempt remains significant. Awkwardly, Maliki will remain prime minister while Abadi now tries to form a government with Sunni and Kurdish support. Though no one believes that Islamic State/ISIS/ISIL has enough strength to capture Baghdad, it now possesses US-made weaponry left behind by the national forces in northern Iraq. Moreover, if Maliki tries to use the Iraqi military to cling to power, it could divide an already weak national army, making it easier for Islamic State/ISIS/ISIL to take advantage of the chaos. Looking beyond the Maliki era, however, there’s no indication that Abadi has the political will to deliver the kind of Sunni autonomy that could restore stability to Nineveh and Anbar provinces by empowering less radical Sunni leaders, such as Osama al-Nujayfi, former Iraqi speaker, and his brother Uthil al-Nujayfi, nominally Nineveh’s governor. The Nujayfi brothers lead Muttahidoon (ائتلاف متحدون للاصلاح, Unity Coalition), the largest Sunni bloc in the Iraqi parliament, and as Kirk Sowell writes for Foreign Policy today, their middle-way approach, including significant devolution of financial and security powers to local Sunni leaders, seems implausibly trapped between a Shiite-dominated national government that controls Iraq’s budget and radical jihadists who are hellbent on forming a cross-border fundamentalist caliphate.